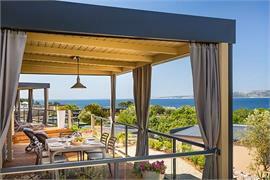 Holiday rentals and holiday accommodation on the island of Krk, Croatia – a large selection of apartments, guest rooms, hotels, villas, holiday houses, B&B and so much more for your Krk holiday. Book your holiday online! An open view of the old town of Vrbnik. 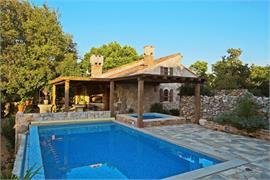 A newly built Tuscany-style two-level stone villa. 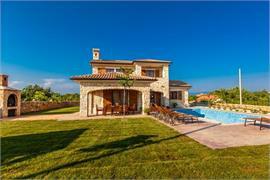 It creates an oasis of peace in a Mediterranean surrounding with the Villa MENTA I.
Villa MENTA I and Villa MENTA II are very special rustic villas surrounded by a drystone wall on a spacious Mediterranean courtyard with 2 swimming pools. 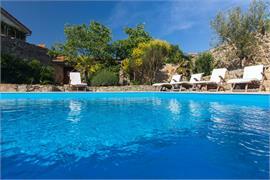 Beautifully renovated stone farmhouse surrounded by mature Mediterranean vegetation and featuring a pool and a jacuzzi. Typical old house with jacuzzi in the garden. 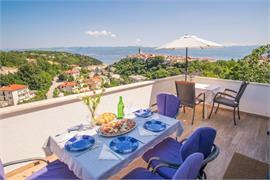 Mobile homes in 'Camping Krk' (Politin) are placed in a superb position close to the waterfront. This is a textile family campsite with a dedicated naturist beach. 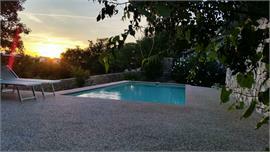 The campsite also features outdoor swimming pool.